After a long frustrating experience, I've finally fully upgraded my Docomo-branded Xperia X10 (which as been officially abandoned to Eclair). For now it's is running Wolf's Gingerbread ROM. The reason this took so long is partially because I am most experienced with unix-like operating systems and HTC phones, so I lack experience with Windows and Sony Ericsson - each of which do things very differently from what I consider "normal" and "efficient". Lack of documentation surrounding Flashtool, which is needed to flash new kernels and radios, also caused me some issues. And running XP in Virtual Box added an extra layer of complications and uncertainty - when something doesn't work, is it a bug in the software, a problem with windows, or an issue with the VM? Adding commands to the windows path is retarded. Right and left click a bunch of times until you get to the place where you can set environmental variables and type this into the itty bitty text box to get ddms and adb added to the path: %SystemRoot%\system32;%SystemRoot%;%SystemRoot%\System32\Wbem;"C:\Program Files\Android\android-sdk\platform-tools";"C:\Program Files\Android\android-sdk\tools"
Kernels and basebands (radio) can only be flashed with flashtool. Once upgraded to the Gingerbread kernel and baseband, you don't need flashtool to flash new ROMs because everything else can be done though recovery. 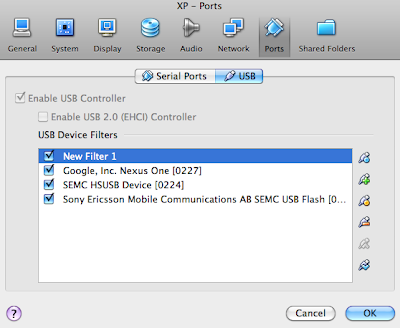 Flashtool contains the drivers necessary for flash mode. There is no documentation regarding this or mention of it on the main two posts. After installing flashtool, check the drivers folder and run gordon gate setup. Or create a catch-all, generic USB filter that will capture everything plugged into a USB port (New Filter 1).